Area baseball and softball teams continued their hot start to the season with some big wins last week and the week ahead provides a chance for many of those teams to add to their win totals. Bristol Eastern baseball and softball remain unbeaten after the first two weeks of the season, as is the St. Paul boys lacrosse team; while Bristol Central baseball and St. Paul baseball, softball and girls tennis each have just one loss on the year. All will have the chance to add to those win totals this week. Eastern’s baseball squad has been impressive, with two shutout wins in the early going, but the Lancers will be tested this week with games against some of the top teams in the CCC South. The Lancers host Berlin, weather permitting, today and travel to Platt on Wednesday before taking on Newington in a 2 p.m. start on Friday. Berlin is 4-1 after a tough loss to Southington last Friday and leads the CCC South Colonial Division. Platt returns from its Florida trip to take on the Lancers on Wednesday. 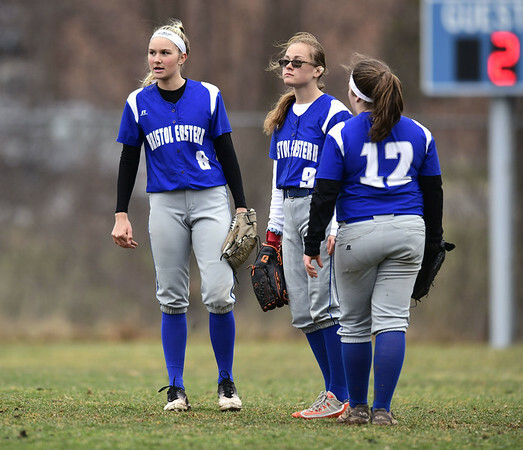 The Eastern softball squad had a couple of big wins last week and looks to build on its CCC South Patriot Division lead with games at Berlin today and at home against Platt on Wednesday. The Lancers travel to Enfield for a tough interdivisional match on Thursday. Bristol Central baseball bounced back from a tough 1-0 loss at Hall on Thursday to shut out a very good Newington team and improve to 4-1 on Friday. The Rams will have a chance to add to their CCC South win total at home today against Middletown and Maloney on Wednesday. The Rams already own a lopsided victory over the Spartans. Central travels to Farmington for an interdivisional match on Thursday. St. Paul’s baseball squad dropped its first game of the season at Sacred Heart last week, but came back with a win over Oxford to improve to 4-1. The Falcons host Torrington today and visit Watertown on Wednesday before coming home to battle Wolcott, also 4-1 heading into the week, in a big NVL contest on Saturday afternoon. The Falcons’ softball squad dropped a close one to perennial power Seymour, but has dominated the rest of its opponents. St. Paul is on the road at Torrington today and hosts Watertown on Wednesday as they take on a pair of teams with losing records. St. Paul will visit unbeaten Wolcott in an NVL showdown on Saturday. Bristol Central’s young softball squad ran into a tough stretch last week to fall below the .500 mark and will look to turn it around this week against a pair of struggling opponents. The Rams visit Middletown today and take on Conard in West Hartford on Wednesday. Terryville baseball picked up two big wins last week to move above the .500 mark. The Kangaroos will look to extend their win streak at winless Wamogo today before stepping out of the Berkshire League to visit Plainville on Wednesday. Terryville then hosts Lewis Mills in a big Berkshire League contest on Thursday morning. Terryville softball will take the spring break week off after starting the season 1-2. Track takes center stage on Tuesday as Bristol Central tries to extend its CCC South win streak at home with a match against Berlin and Platt. The Berlin girls are expected to give the Central girls a strong challenge, as both are unbeaten on the year. Eastern’s track teams travel to Plainville for a CCC South matchup. The Eastern girls are unbeaten on the season and should be in a tough battle with a strong Blue Devils squad. Terryville’s track athletes will be in Litchfield Wednesday morning to take on the Cowboys along with Wamogo. St. Paul has the week off. The St. Paul boys lacrosse team has been the most successful of the area lacrosse squads, as most have struggled in the early going. The Falcons have rolled over both of their early opponents and get back in action after a week’s layoff at home on Thursday against East Catholic. The St. Paul girls earned their first win of the season last week and will host Wolcott on Wednesday in their only action of the week. Bristol Central’s girls picked up two early wins, but the Rams have struggled defensively in their last two outings and this week won’t be any easier for the fledgling program as it travels to take on unbeaten Tolland on Wednesday in its only match of the week. Bristol Central’s boys, after snapping a long losing streak early in the year, have also struggled in recent outings as they have fallen to 1-4. The Rams will need to look to find ways to put the ball into the net as they travel to Rocky Hill today before coming home to take on first-year program Enfield on Thursday. Bristol Eastern’s boys and girls teams are still looking for their elusive first win. The Lancer boys will have their hands full against perennially strong Berlin at home on Thursday, while the girls face a similarly strong opponent at Northwest Catholic on Wednesday. For most of the area tennis teams, victories have been hard to come by. Bristol Eastern’s girls earned their first of the season against Bristol Central on Friday, but this week’s matches against Berlin on Tuesday and at Wethersfield on Thursday are going to be tough challenges. The Central girls are still looking to break into the win column and will have two chances at home this week, against Middletown on Monday and Windsor on Wednesday. St. Paul’s girls are 4-1 in the NVL and host Watertown today, visit Kennedy Wednesday and host unbeaten Naugatuck on Thursday. Central’s boys are on the road for three this week - at Middletown Monday, at Bulkeley on Tuesday and at Wethersfield on Wednesday - as they search for their first win. The Eastern boys have not played in almost two weeks and the schedule this week is formidable, as they travel to Berlin today, host Conard on Wednesday and visit Rocky Hill on Thursday. Posted in The Bristol Press, Bristol Central, Bristol Eastern, St. Paul, Terryville on Sunday, 14 April 2019 21:05. Updated: Sunday, 14 April 2019 21:07.